Thomas Moran was one of the artists who in the mid-nineteenth century produced landscape images of the West that contributed to and reinforced the development of an American identity. These views, however, were frequently constructed, edited, or manipulated to reinforce a sense of national pride and feeling of unity during and immediately following the Civil War. This ethereal view of the famous site of Half Dome in Yosemite was based on Moran’s many sketches of the scene, drawings and photographs by other artists, as well as his recollections of his many visits there. Cooper-Hewitt’s Moran collection includes two other significant works on paper showing the same scene over more than a decade; a black and white sketch from 1872 and an etching from 1887. Drawing: Half Dome, Yosemite, 1872. Artist: Thomas Moran. Gift of Thomas Moran. 1917-17-15. In the earlier view, Moran is located in the middle of tall woods on a hillside opposite the bald mountain. Following a standard landscape convention going back to Thomas Cole in America, he places tall dark Sequoia trees behind some large boulders in the lower right corner to create the feeling of distance between the foreground and the upper section of Half Dome looming beyond. Print: The South Dome, Yosemite Valley, 1887. Artist: Thomas Moran. Museum purchase through gift of Mrs. Gustav E. Kissel. 1949-102-2. 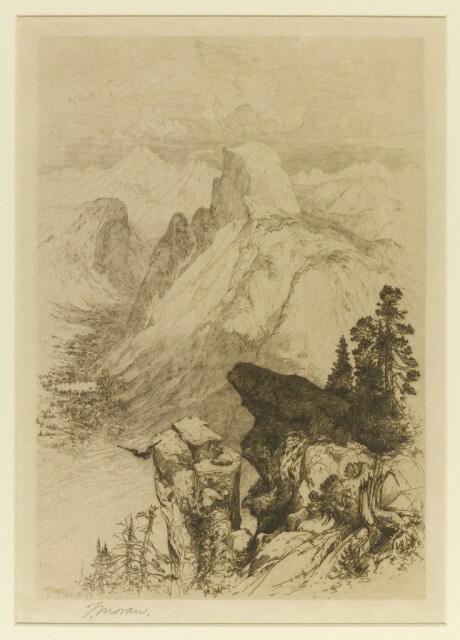 A comparison of this sketch and the etching made fifteen years later shows that the artist in the etching has captured an aerial view from further away and at a higher angle. Moran retains some of the trees in the earlier sketch but they are much smaller in respect to the landscape and the two boulders have become large outcroppings of rock on the near mountain side. The fresh and airy watercolor view of Half Dome from 1873 uses the same artistic convention of placing dark trees in the lower right corner to establish the foreground but rather than fill the front plane with trees he employs several large rocks or boulders. Behind the foreground plane, the hillside slips away into the valley from which grows the Half Dome and two other mountain ranges behind. The beautiful purple shadows on the distant mountains create the sensation of a cold wintery day in the late afternoon. Most likely, Moran constructed this highly finished watercolor in his studio rather than on the spot in the open landscape. He referred to this watercolor when creating the 1887 etching that follows the same basic composition. The point of this brief discussion of the Half Dome views is that Moran edited out what he would have actually observed to achieve the best possible view of this amazing landscape that has become part of the American imagination. 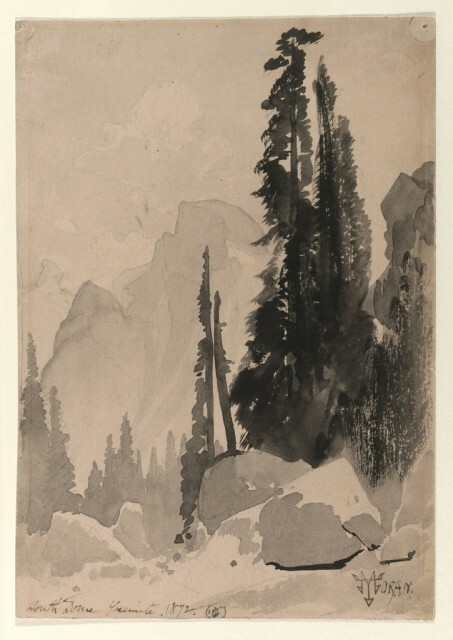 Artistic images like these were among the factors that convinced Congress to declare Yosemite a national park in 1890. Drawing: Half Dome, Yosemite, 1873. Artist: Thomas Moran. Gift of Thomas Moran. 1917-17-32.